Update: voices heard. The artwork is restored. 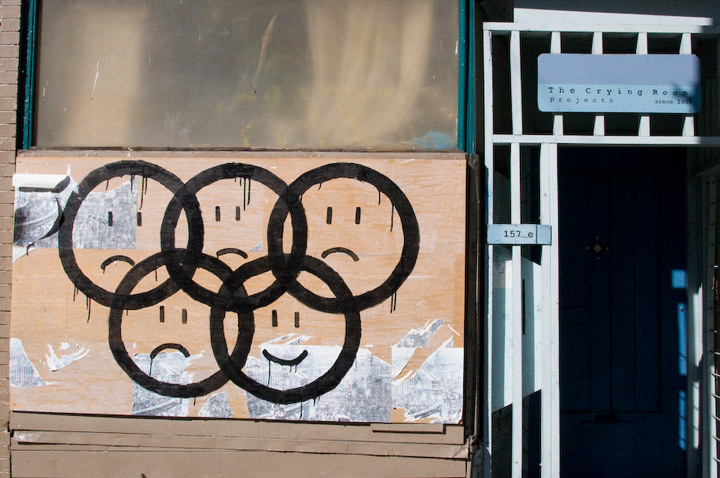 The city of Vancouver has ordered the removal of a mural hanging outside a Downtown Eastside gallery depicting the Olympic rings as four sad faces and one smiley face. The gallery says in 10 years, it has never before been asked to remove any work. The city issued the order under its graffiti bylaw, but it comes in the wake of a debate over a controversial city sign bylaw that opponents feared would allow officials to stifle anti-Olympic expression. “It has nothing to do with content,” Ms. Beer added. The Crying Room began in 1999 by Vancouver artist Colleen Heslin as a gallery space to exhibit local emerging artists. Several artists along the way have helped shape and form the exhibitions and direction of the space; Elizabeth Zvonar, Jason McLean and Steven Horwood played vital roles for the inception, content and context of the space. The Crying Room has presented and hosted over 50 exhibitions with a wide range of media: drawing, photography, collage, books, dolls, sound, installation, performance, sculpture, mixed media, video, posters, drawing booths, G8 action figures, concerts, dollar sales, etc…Currently the only public exhibition space is the mural project space in the front of the gallery, and this virtual space. The photo here is from the Flickr photostream of “The Blackbird”.